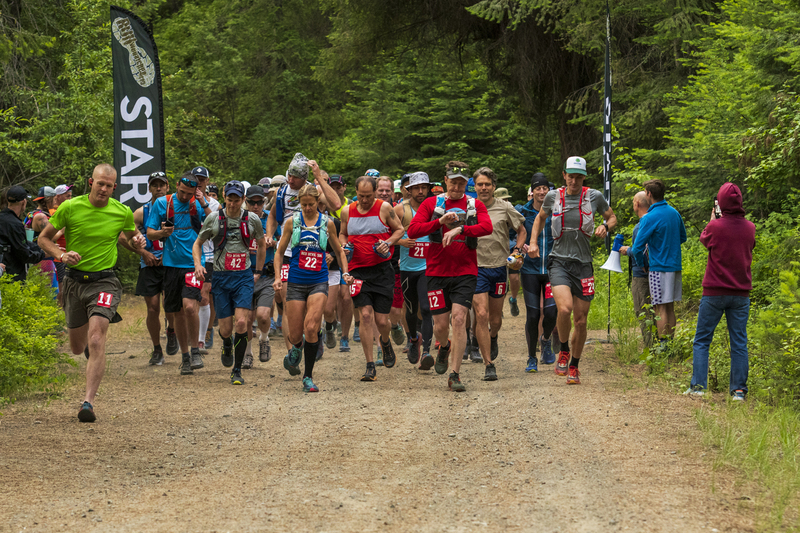 Red Devil 50K runners bolt from the start line on Saturday in the Wenatchee National Forest south of Cashmere. CASHMERE — It can be hard to spot other runners on the Red Devil Trail Run courses, given the turns in the trails, tree cover, and up and down terrain in the Wenatchee National Forest. 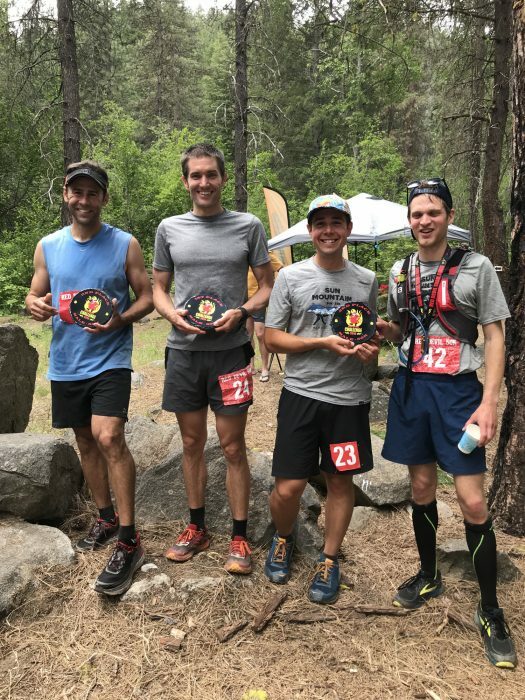 Top 50K men’s finishers, from left to right: Will Young, second; Peter Graf, first; Colton Gearhart, third; Emerson Peek, fourth. But Peter Graf and Will Young pretty much knew where the other Cashmere resident was during the entire course of the grueling inaugural Red Devil 50-kilometer (31-mile) race on Saturday that Graf ultimately won by 17 minutes over Young. Graf took the lead at about the 3-mile mark. Young followed in a chase pack that was originally three runners and then expanded to five. After that, Graf and Young separated themselves. But the drama didn’t end there. 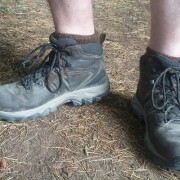 With a climb of about 3,000 feet ahead, Young passed Graf on the Mission Ridge Trail. About half-way up the trail, Graf returned the favor. “I got him and then I was able to hold it,” he said. 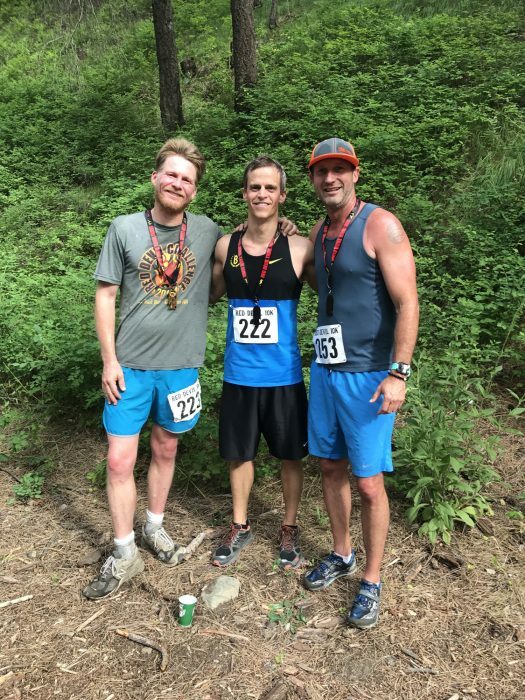 Graf completed the 50K course, with total elevation gain of about 7,200 feet, in five hours, 15 minutes, and 39 seconds. Young finished in 5:32:20. Colton Gearhart of Coudersport, Pa., took third in 5:38:37, edging Peshastin’s Emerson Peek by a mere 2 seconds. In the women’s inaugural 50K, Leavenworth’s Marlene Farrell won in a time of 5:46:33 (Farrell was sixth overall). Runner up was Olga Neutrinos of Issaquah in 6:15:17, followed by Leavenworth’s Candace Burt, who finished in 6:32:40. 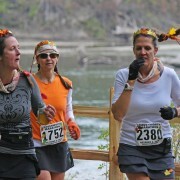 Top 25K women’s finishers, from left to right: Cody Graf, second; Heidi Loewen, first; Marysutton Carruthers, third. Farrell, who last ran a 50K about 15 years ago, said she had to discipline herself to eat food and drink water even though she initially didn’t feel the need. “I was good in not going too fast,” she said of pacing herself. In the Red Devil 25K, the women’s winner was Wenatchee’s Heidi Loewen, who finished in 2:40:46. Cashmere’s Cody Graf, the wife of men’s 50K winner Peter Graf, was second in 2:49:26. Marysutton Carruthers of Cashmere came in at 2:50:06. Wenatchee’s Chad McBride took home the men’s 25K crown in 2:16:13, followed by Wenatchee’s Anthony Skierkiewicz (2:23:27) and Sammamish’s Maxim Kazitov (2:27:24). Phillip Hochwalt of East Wenatchee captured the men’s Red Devil 10K in 43:47. Leavenworth’s Andrew Holm was second in 44:33, and Wenatchee’s Mike Parrish was third in 49:02. 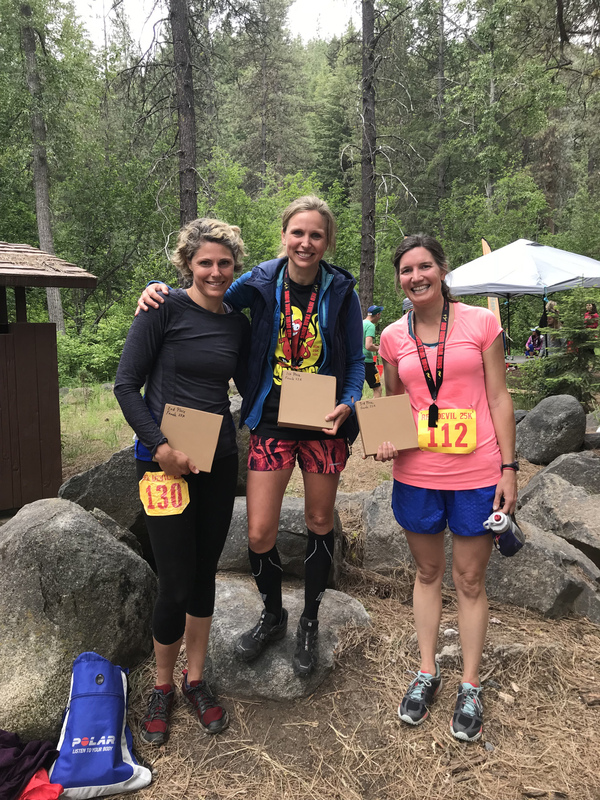 Jennifer Albrecht, who later volunteered at the Devil’s Gulch Aid Station for the 25K and 50K runners, won the women’s 10K race in 54:58. Wenatchee’s Esperanza Estrada was runner-up in 58:25. East Wenatchee’s Chuch Bassett was next in 58:43. “I kind of ended up running by myself a lot, there was a gap,” said Albrecht, an Eastmont High School grad who recently graduated from Gonzaga University, where she ran track. 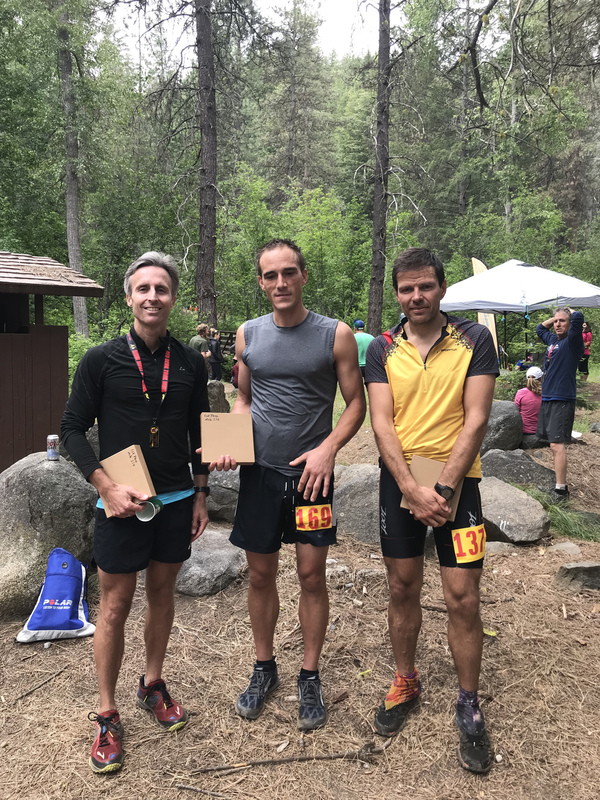 Top 25K men’s finishers, from left to right: Chad McBride, first; Anthony Skierkiewicz, second; and Maxim Kazitov, third. The eighth-annual Red Devil event, put on by RunWenatchee, attracted an overall field of about 200 runners. The races sold out for the second year in a row. Red Devil’s start/finish is at the Sandcreek Trailhead south of Cashmere. 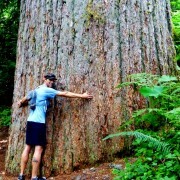 Trails utilized include Red Devil, Red Hill, Devil’s Gulch and Mission Ridge. 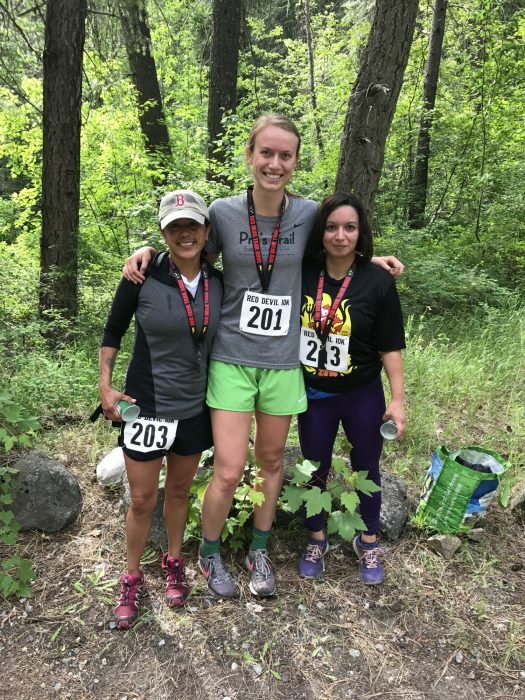 Candace Burt, a Leavenworth resident whose Destination Trail organization puts on several iconic trail races in the Western United States each year, wrote on her Instagram account that her third-place showing was the fourth consecutive time she has finished in that spot in a race. Graf, the men’s 50K winner, agreed. Top 10K women finishers, from left to right: Chuch Bassett, third; Jennifer Albrecht, first; Esperanza Estrada, second. Top 10K men’s finishers, from left to right: Andrew Holm, second; Phil Hochwalt, first; Mike Parrish, third. For complete results, please visit https://ultrasignup.com/live/live.htm?dtid=29305#search.